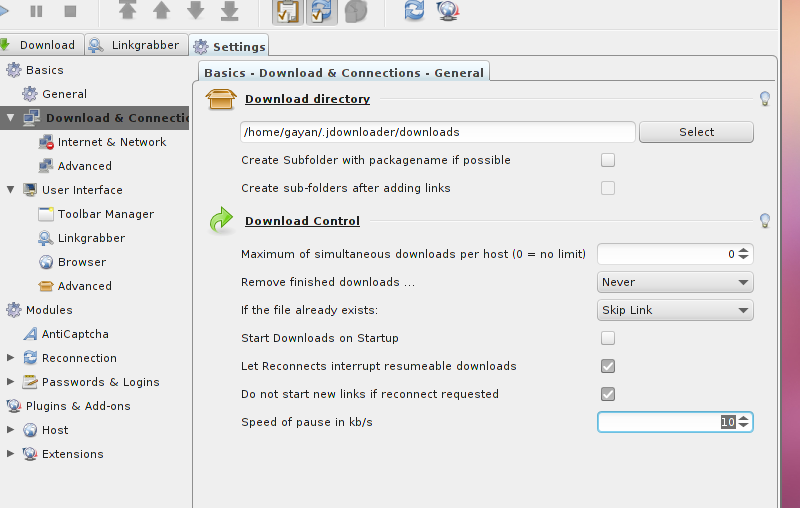 JDownloader is an open source platform independent file upload & download manager written using Java. But being a Java application, the whole “platform independent” thing comes with a cost. That is, every time you run JDownloader it needs to load the Java run-time engine (which is sort of a virtual environment) and it takes a reasonable amount of your system resources (talking about the RAM here). But, if you have a somewhat powerful computer and looking for a file downloader that comes with a lot of useful features (including support for a lot of online file sharing services etc), then JDownloader might suit your needs. *. Support for (including support for premium accounts) : Rapidshare, Mediafire, Filesonic, Megashare, Megaupload, bitshare, easy-share, uploading and more. *. Both anonymous and site log-ins (premium log-ins) are supported. *. Use up to 20 connections per file. *. Firefox integration via the Flashgot add-on. *. Automatic link grabbing feature (by monitoring the clipboard of course). *. Set download speed limits (useful if you wanna browse web without slowing down things that much while downloading a file) and change the default file download locations. *. 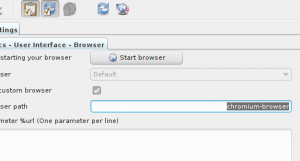 Change the default web browser for opening URLs. *. Merge/Split and Uncompress files (with RAR password protected files support). *. Automatic CAPTCHA recognizing (may not always work though). *. Enable/Disable run at system startup. *. Minimize to system tray. *. Auto detect router (authenticating etc) or configure settings manually. *. Save the current files to a list. *. Grab videos from online video hosting/sharing sites such as YouTube (including the newly invented MP3 only support), Vimeo and Clipfish. *. Show/Hide network speed graphs. *. Support file decryption for CCF, DLC and RSDF formats. You can install JDownloader in Ubuntu 11.10 Oneiric Ocelot, 11.04 Natty Narwhal, 10.10 and 10.04 by adding its PPA channel. As usual, simply open your Terminal window and type the below commands. If you want the up-to date packages then you can use the daily builds PPA. However these packages might be a bit unstable thus use it at your own risk :). For that, just replace the first line of the above commands with the below one. For other OS platforms, please get it from this official JDownloader home page. Once the installation is complete, open your Terminal window and enter the below command. Wait for few seconds and you should see a new window which should download some dependencies (which will take few more minutes) prior to launching the application. I used it installed in my Ubuntu 11.10 for this review and I measured its system resources usage (Java runtime library) and to be honest the memory usage is very high. Now I have nothing against Java but I honestly don’t think designing a cross-platform software using Java virtual environment is such as a good idea. As always, it failed to render the fonts with anti-aliasing etc under Ubuntu but the themes did integrate with Unity desktop quite well. It also took reasonable amount of time for loading the app itself. So if you have a bit of an old Laptop/Computer like me, then you’d better not enable it to run at system startup either. Because of these issues and if your daily downloading needs are somewhat simple & searching for something that you can use under Ubuntu (GNU/Linux in general) then I humbly suggest that you give a try at something light weight such as UGet for instance. But that being said, if you’re one of those geeks that have specific needs (such as dealing with online file sharing accounts and servers for file downloading/uploading) and looking for a utility that can help you with that and willing to pay the “price” then JDownloader is a handy tool. Chrome OS Linux (1.7.932 RC) Live CDs Available for Download! Cinelerra (video editor) is now Available for Ubuntu 11.10 and 12.04!